Since I love to try interesting meat toppers and relishes, I was excited to see a hundred-year-old Apple Relish recipe in a 1915 Ladies Home Journal. This recipe is a winner. The Apple Relish was easy to make, and is one of the best tasting relishes I’ve ever eaten. 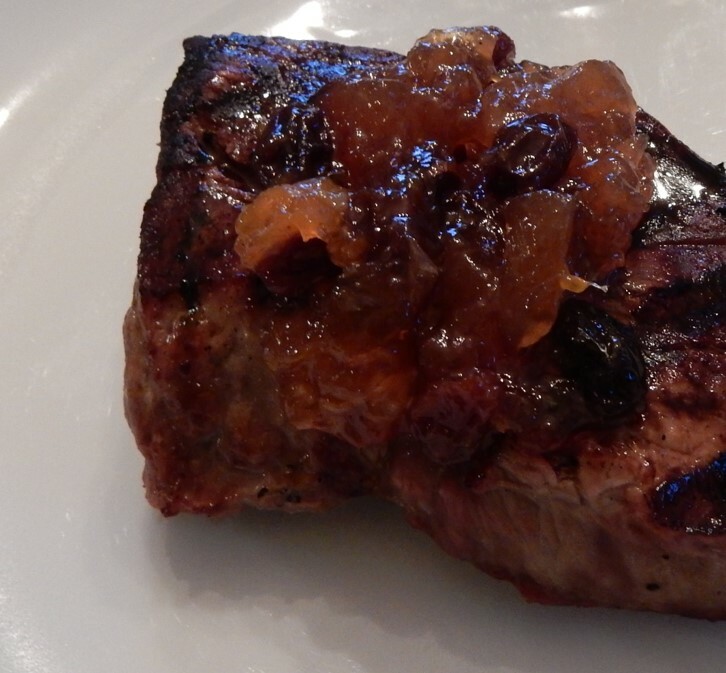 Its sweet-sour, spicy, fruitiness perfectly complements grilled or roasted beef or pork. Combine all ingredients in a large pan. Bring to a boil, then stir occasionally and boil steadily for half an hour. Ladle into hot half-pint or pint jars. Wipe jar rim, and adjust lids. Process in boiling water bath for 15 minutes. Posted on October 5, 2015 September 3, 2017 by SherylPosted in Food, recipesTagged apples. Once again, something I’ve never heard of: apple relish! Thanks for sharing – this sounds yummy! It’s a nice condiment–and can make a basic meat dish more interesting. People around here love relishes. They’ll pickle just about any thing. The vinegar, is it apple cider or the white? The recipe didn’t specify which type of vinegar. I used apple cider vinegar. Oh that would be fun to make. It was surprisingly easy to make. Apple stuffed pork loin is a favorite, and baked butterflied chops with onion and apple are a fall favorite. This is clearly in the same family, and I’m eager to try it (though I’ll cut the recipe — easily enough done). mmm. . . I’m getting hungry just reading the list of your fall pork and apple favorites. It would be easy to cut the recipe–and then, depending upon how fast you plan to eat the relish, you may not even need to can it. Yes, it would be good that way, too. We like to make applesauce. I have never tried relish. Sounds very tasty! My husband would love this! Me? Not so much–I’m not a fan of raisins in other food. Hmmm . . . but if we left out the raisins I bet it would still be good!! Yes, I bet it would be good without the raisins. Recipes that included dried fruits (raisins, prunes, dates, figs, etc.) as an ingredient were very popular a hundred years ago. I think it was difficult to transport many fresh fruits long distances back then, but that transportation systems were modern enough to transport dried fruits long distances. Good suggestion–especially if you used apples that weren’t particularly tart. Sounds oh so delish!Would this also be considered chutney? I had a friend in Arizona that made ‘chutney’ every fall and gave as gifts during the holidays. This looks like a winner…yummy on pork chops! In my opinion, it probably could be considered a chutney. It seems like the names of some food differ across geographic regions and time. Yes….I think you are probably right! Whatever region….I think we’ll just call it delicious! How absolutely delicious and EASY! It is surprisingly easy to make.